Philadelphian Jennifer Barr is the grand-prize winner in the “Alvin and the Chipmunks” movie contest, which means she’s the owner of a Nintendo Wii and the Alvin game to play on it. Barr also won a basket of munkalicious treats from Goodie Goodie Gumdrops. Michael Porter, also of Philadelphia, won the iPod Video Nano and 10 other lucky Daily News readers won “Alvin and the Chipmunks” prize packs. They are Keturah Williams, Natalie Jones, William Boyle, Janet Morgan, and Jack Rivas, all of Philadelphia; Janet Lisa, of Langhorne; Joe Stelacio, of Lafayette Hill; Susie Blank, of Bala Cynwyd; Gray Newman, of Feasterville, and Meredith McEwing, of Clayton, N.J. “Alvin” opens this Friday.Gwendolyne David, of Philadelphia, is the lucky winner of a Gibson Les Paul Standard Gold Top guitar in our contest to promote the movie “Juno,” which also opens Friday. Winners of “Juno” prize packs are Robert Blair, Gloria McCauley, Michael Beachem, Samantha Brennan, Maureen Schindle, all of Philadelphia; Carol Chavarria, of King of Prussia; Kurt Pirmann, of Warrington; Amy Helm, of Chadds Ford; Robert Clark, of Aston, and Mary Freeborn, of Eddystone. Still, the question remains: Can Hannah Montana save journalism as we know it? Gosh, we sure hope so. 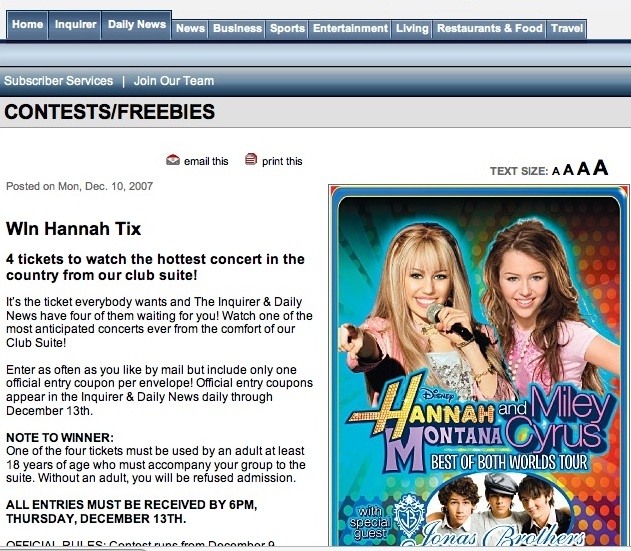 This entry was posted on Wednesday, December 12th, 2007	at 4:16 pm	and is filed under News	. You can follow any responses to this entry through the RSS 2.0	feed. You can leave a response, or trackback from your own site.